Trading at the extremes helps identify price action that is about to make explosive moves. Catch the start of the moves before most traders have realised what is happening. False breaks and fades happen so very often in markets. Traders need an edge and must have a strategy to trade the Extreme power moves that so often follow. Extreme Activity Candles show you where the balance of price action power is located and which way you should be trading it. Uses TradeStation or MetaTrader MT4 charting. Conventional price action traders strip away everything except the price bar or candle. They base their analysis on these and the basic interaction between them. Now I'm mainly a price action trader, but there are several things that I add in to price action and, chief amongst these, is knowing where the balance of power is. Not all price candles, or price bars, are equal. This also applies to the conventional patterns that most traders use and also to things such as support and resistance levels. Extreme activity candles show where the balance of power is building up pressure - or not - that is about to produce the next major thrust move. There's an old truism that says if you can buy right you can always sell right. It originated from shop keepers of years ago and in any business it's a winning strategy and it applies just the same in the world of trading. Scalpers and day traders need an edge and maximising profit opportunities is the aim. The Extreme software shows where the balance of buying and selling power is pointing, enabling the trader to enter, not too soon and not too late. This 21 pip trade started the day as the Extreme software showed the entry level and also the exit. The way in which The Extreme Trader works in any market, Stocks, Indices, Commodities and Forex. Right now Forex is probably the best of all markets to trade. It has everything going for it, very accessible to anyone no matter what their account size, continuous pricing, open 24 hours and it ranges and trends. Day traders need a market that is worthwhile to trade, that is, they need enough movement at key times of the day, that will trend profitably. The previous example was a typical trade that gave just over 20 pips ($200 on a standard lot). By adding in another trade a little later in the day the trader could have added another 36 pips again signalled by the Extreme software. Add the trade trades together and our trader is now up by $560! 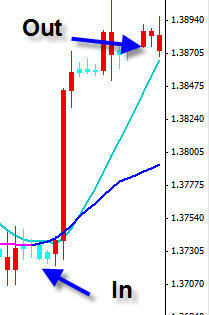 and that's just one contract and one pair, the EURUSD. For years I have used volume in my analysis of price moves as do many traders, but there was something missing. I mainly trade the Spot Forex market where conventional volume figures are just not available so the Extreme trader displays the amount of participation instead. This is then displayed as a color of each individual bar or candle and so, at a glance , the difference between bars can be plainly seen. Using either MT4 from GKFX or TradeStation charts, the Extreme software highlights where the balance of power is acting most strongly and that's the direction I want to be trading. When I showed this to an friend, he was once a trader on the old LIFFE trading floor, he immediately said it was just what he needed when he transitioned to screen based trading. Way back all the major markets were traded by open outcry. There are still some of these pits in operation but most have now become screen traded of course. The floor traders always had one big advantage and that was that they could see sudden surges in activity. There was mayhem, 'phones rang, clerks started signing and rushing orders to the floor traders that would frequently kick off major moves. It's these extremes of rapid activity, or the opposite, very little activity, that can show where the balance of buyer or seller power is, and that can be very valuable information. It's not just for day trading. Longer term trading, particularly in Forex, benefits from some major moves. Recently we have seen the AUDUSD trend for months running through well over a thousand pips, the JPYUSD has done the same and now the Euro has joined in. These swing moves can run for just a day or two ( as in this 135 pip move) and often for weeks on end. The Extreme Trader works with any time frame and any market. "I like the logic behind the colouring of the candles, it makes total sense to look at what the activity is doing. I'm using it now to confirm trades from the harmonic wave trader" Paul. Candle charts are very effective at showing part of the picture. Visually they are a great improvement over open-high-low-close charts, but they both leave out the most important component. The amount of participation by traders as the candle is being created. Not all candles are equal. You may be familiar with Hammers, Shooting Stars and so on, but this brings in a whole new dimension. By adding in trader buying and selling activity, you now have a more complete picture of where those candles are going. 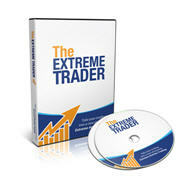 This is one of our original courses that works with the Extreme Trader, you can read more here. And, if you decide to take both, the second one comes with a further �40 discount! Just let us know you would like both when ordering. It is often said that Money Management is the key to successful trading. What I would add is the discipline to stick to a method of trading that gives an edge is just as important. The two go together and included is an updated money management section. The reality is that far too many traders somehow ignore this and find themselves taking frequent losses and only tiny and occasional wins. The course shows how to reverse this and reduce losses dramatically whilst increasing the odds of taking regular profits using a simple trade management process. "Hi George, Received the course this morning, thanks for the quick turn round. I've never been aware of this before, you've certainly open my eyes to how useful this will be. Thanks again. Matt." "Hi George, I've just completed the Extreme Course and I'm really excited by the way you've blended a number of techniques into a robust strategy" Rich. 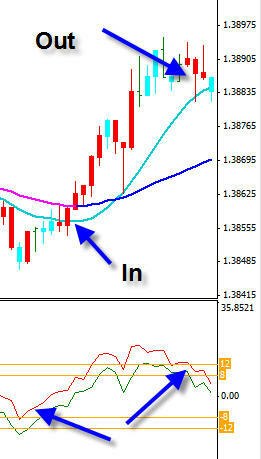 "I'm sold, I've been trading the Euro both ways, three times today, up 124 pips...." Iain P.
"Thanks for setting up the MT4 software for me yesterday, great service. I'm using it with the Harmonic Wave Trader, shorted the pound at 16647 and covered a 16596...MJ. "I would like to say how helpful I have found the power bars. I would not like to be without them. SW"
"Today I have traded 3 trades off the 15 min charts all won (all very small stakes). KC"
The full, two CD series, of The Extreme Trader is now available regularly at �379, but check the special offer price below. The package FULLY includes your first three months FREE membership of Traders Class that gives you full access to twice weekly analysis with mentoring video's, software assistance and ongoing support for your trading success. Click the order button for the Extreme Day Trader. Same day dispatch at an affordable �379, for a limited time only �279 and a payment plan! Buy now for just �139.50 now, then �69.75 in 33 & 66 days time. fully inclusive of lifetime licence and software support and no quibble guarantee. Lines are open Monday to Friday, 10am to 4pm BST. International customers dial +44 118 983 4716. In addition, I would like to totally eliminate any risk that you feel you may be taking. Place your order online or by calling 44(0)118 9834716 and if, you do not agree that the techniques you are exposed to will not give you a set of tools and strategies that will help you in your trading, then you can request a full thirty day from delivery, no quibble refund. Subject only to illegal copying checks as noted on the discs and return in as new undamaged or marked condition.